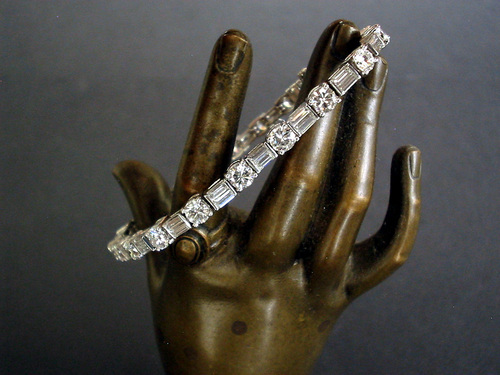 Exquisite Art Deco platinum bracelet with alternating 40 pieces of round brilliant and emerald / baguette cut diamonds with estimated total diamond weight of about 8.5 carats. The bracelet is 170mm long and has a platinum weight of 19.1 grams. The 20 round brilliant diamonds have an average diameter of 4.1mm and the remaining 20 emerald / baguette cut diamonds have a size of about 3.7mm x 3.2mm. All diamonds are fantastic average E/F color and VVS1 clarity. The bracelet is numbered and hallmarked for Platinum and is most likely of an American origin and manufacture during the 1930ies. Scarce piece of collector jewelry / jewellery and one of the nice American Art Deco era diamond bracelets and jewels.